Is the residency only for poets? Yes. This is the express wish of the residency founder, Elizabeth Hansen. There is however no pre-condition as to which type of poet you have to be, how successful you feel you are, what language you write in. But all the contacts we are working on establishing for you in Paris will be looking forward to welcoming a poet. If you are a fiction writer, or an illustrator, then consider applying to the original Trelex Residency in Switzerland instead. Can a partner stay with me? No. 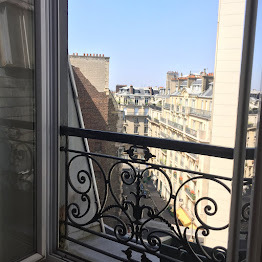 If you wish to share part of your experience of Paris with a friend or a partner, we ask that you keep the residency space for your work and book a bed and breakfast or airbnb to share during their visit. As a matter of policy, we go out of our way to accommodate artists who are also parents. So you may share the studio with a child. However the studio is not childproof in any way and the low window alone is a huge hazard. Still, we believe parents will know best how to balance their needs and those of a child. As long as you have understood that this is completely your responsibility and at your own risk. How can I thank Elizabeth Hansen? Elizabeth Hansen set up this residency inspired by the Trelex Residency which believes strongly in not putting pressure on artists to deliver anything specific during a residency so that you may instead enjoy total artistic freedom. So you should not budget for a present of any sort or feel you need to leave anything behind. You can write your name in the guest-book where you can share a poem if you feel like it (don't spend your residency agonising over this). If you feel like sharing a volume of your work or of someone else's you can add to the poetry library shelf. But these are more for the benefit of subsequent resident. With that in mind, we also ask you to contribute a short text (with photos if you wish) about your stay. This should be a sort of conversational piece: write it with the next residents in mind. Finally, the most important thing you can do is to recommend this to the next poet. Can I tell any poet about the residency? In principle, yes. The residency is never advertised and works by word of mouth. You don't have to look for the best and the most famous (they are probably swamped with residency offers as it is, anyway). Help us instead by thinking of the most interesting, someone who will engage with this project, enjoy it, use it productively. Someone who will be as excited about it as we are. That is th biggest gift you can make. French law requires you to have personal liability insurance (a concrete case: you leave the shower on because you are distracted and it floods the flat below). You need to check with your own insurance (if you have personal liability insurance in your country of residence) or with your travel insurance whether you are covered for this. If you are not, you can purchase this insurance separately here (at time of writing, yearly cover about Euro 36). We will require proof of cover for this. Re. travel insurance, ultimately it is up to you but we highly recommend having some. If you have an accident and require the French medical services we cannot accept responsibility for you or the costs. It could also prove useful in the event of other incidents such as loss, theft, or damage. How long can I stay: We generally prefer people to come for a minimum of a month. This is because we cannot ask those who will welcome you to be available for new artists every couple of weeks, for example. This said, if you are coming to Paris for a reading or an exchange you have arranged yourself, we may consider a request for a shorter stay. Though we will be reluctant to book someone in for a week in the middle of a longer free period. You are welcome to come for up to three months, either in one go or over repeat visits.